As the forecast for yesterday was for heavy showers, we decided to stay put. The showers didn’t materialise till later, and then were only light. So we spent the day just pottering about on the boat. We had some occasionally noisy neighbours, though. The sheep were stripping the bark off the fallen branches. 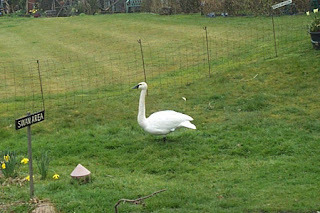 This guy's a long way from home.... Trumpeter Swan, native of N America and Alaska. Today started cold and drizzly, but brightened up a bit by 10:00. The East wind was still cold, though. We moved off at around 11:00, towards Great Haywood, where we will stop for the weekend. BW had been doing some extensive tree felling. The River Trent is just on the other side of the trees. Caught Colwich Lock just right, with a boat leaving the lock as we arrived. No hire boaters around to shut the gates in front of us this time! The new gates, fitted during this winter’s stoppage program, are very heavy, with short balance beams. The towpath side gate is poorly balanced and swings open again, like Woodend Lock. The trick is to open a top ground paddle part way, then dash back to shut the gate. The incoming water then holds the gate shut and the lock can fill. We stopped just short of Great Haywood Junction, with a view of Shugborough Hall over the fields. 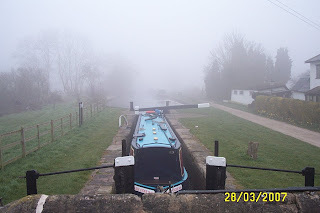 We woke up to a damp, misty morning, but it didn’t stop some early risers on a Canaltime boat. Early Risers. 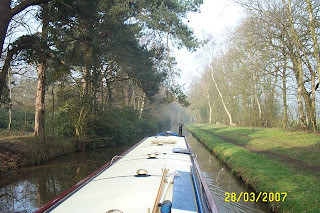 We were off the mooring at 10:30, a few boats had already passed, mainly going down to Fradley. Just 15 minutes saw us approaching Woodall Lock, with another boat just coming out of the chamber. To our amazement, the gates were shut in front of us, and the crew of another hire boat following the first started to fill the lock! They claimed they hadn’t seen us coming, but it wasn’t that misty! A boat came up to the lock behind us, and, as he was singlehanded, we let him into the lock first and locked him through. 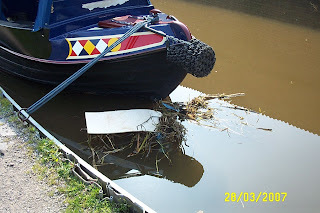 It turned out he was delivering the boat to Kings Bromley Marina, after being serviced at Streethay Wharf. By the time we finally got clear of the lock, the sun had broken through, and the section alongside Ravenshaw Wood was really pleasant. 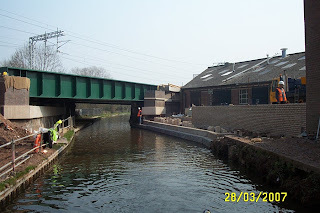 A gentle cruise up to Rugeley, through Armitage where the extended stoppage occurred, and we stopped for a quick shop at Morrisons near bridge 66. Armitage Railway Bridge, site of the extended stoppage. No wonder we slowed down as we entered Rugeley! It was 14:30 by the time we got under way again, and we cruised for another hour before stopping just short of Taft bridge. It’s turning a lot colder tonight, so I guess this warm interlude is over for a while. The forecast is for heavy showers tomorrow. Away from Alrewas at around 10:45, following several boats heading up the Trent and Mersey. Up through the first 3 locks, and stopped at the BW services at the junction for water and rubbish disposal. Low water pressure meant that we took ¾ hour to fill, and then off, across the junction and up the remaining 3 locks of the Fradley flight. We moored just above Shadehouse Lock at 13:30. We’ve not stopped here before, it’s very pleasant, but also popular. There are 7 boats here, now. A lot of traffic in both directions today, with hire boats more in evidence this week. The day started cool and misty, but by lunchtime the sun had broken through, leading to a warm sunny afternoon. Meg and I spent the afternoon out on the towpath, me reading and Meg saying hello to everyone who turned up on the mooring, or walked past. Thursday we spent relaxing, Friday we moved up through the junction, turning right heading in the direction of Alrewas, and moored just short of Keepers Lock on the visitor moorings. This is handy, as it’s only a few yards from a car park. I took advantage of Enterprise Rent-A-Car’s offer to collect me, and arrived back from Lichfield with a Fiesta a couple of hours later. Having “wheels” allowed me to do a big shop at Morrisons in Lichfield, so the boat is now a couple of inches lower in the water! We spent Saturday quietly, just a short excursion to Branston Water Park to see how Meg coped with the car. No problem there, luckily. Of course, Saturday night/ Sunday morning is the start of BST, so the early start on Sunday morning was effectively an hour earlier still! I changed all the clocks and set the alarms for 05:00 before going to bed. We were nearing Stafford by the time the sun was up, and got to Liverpool at around 08:20. But then we had a 30 minute queue to get into the car park! As the last shuttle bus was due to leave at 09:00, I was getting a little wound up! As things turned out, the start was delayed for 20 minutes, so there was plenty of time to prepare. The gun went off at 09:50, it took me 4 minutes to cross the start line, and I was back and changed out of my running gear by 10 to 12. A PB of 1:49:31 means I’ve cracked the challenge of a sub 1:50 ½ marathon I set myself when I started running back in 2004. I rang Mags to tell her I was finished and OK, she was pleased to hear from me, as she couldn’t find the car! She’d taken Meg down to the race course to watch the runners pass, but couldn’t remember which floor of the multi-storey we’d left the car on. I’d made a mental note, so was able to tell her. By the time she’d found it, I’d hopped a shuttle bus and was back there myself! It took nearly 1½ hours of queueing to get out of the car park, so with a break on the way, we got back at around 16:00. This morning I took Meg for a long walk to loosen myself up, but also to give her a chance to run free, as she had been on a lead all day yesterday. Then took the car back to Lichfield and got a lift back. 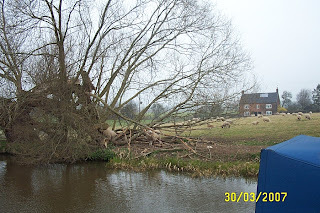 We moved off from Fradley around 12:20, down to Alrewas, winded and back up through Bagnall Lock to moor for the night. We’re now facing in the right direction for our delayed trip up to Manchester. You never know, we might even start it tomorrow! The snow came down as forecast, but didn’t stay around for long. With the north wind persisting, though, temperatures have been a lot lower than lately. 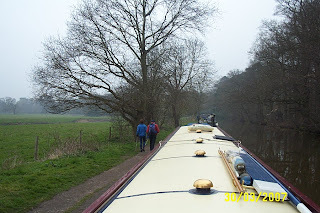 As planned, we left yesterday heading back down the Coventry towards Fazeley. The weather was cloudy with a couple of snow flurries thrown in, but they didn’t amount to much. The wind was cold, though. Mags stayed in the cabin, and even Meg had had enough after 5 minutes on the counter! We went down to Bonehill Bridge and winded, then, as the afternoon had brightened, cruised back up to Hopwas and stopped on the visitor moorings just north of the village. Meg and I had a couple of very enjoyable walks through Hopwas Wood and down by the River Tame. Tamhorn Park Bridge on the edge of Hopwas Wood. A frosty night gave us a clear, bright morning. Chatting with passing locals and Jim from NB “HARE”, meant we didn’t get away till around 11:30, but we still had time to shop at Whittington for a few essentials, before pressing on and getting back to Fradley around 16:00. The mail delivery arrived yesterday (thanks Dot), so I’ve got my entry details and number (4048) for Liverpool, and my driving licence. There’s an Enterprise Car Rental depot in Lichfield, which is only about 3 miles away, so we can drive up to the race from here. It’ll take another hour, but at least we’ll get there. Not wanting to overstay our welcome on the visitor moorings, we moved around the corner today, onto the Coventry. We moored here 2 or 3 weeks ago, it’s better for Meg, and TV reception is better as well. On the way we paid a visit to the sanitary station, then picked up a new gas bottle and some smokeless fuel from Swan Line, just past the junction. Although it has been a dry bright day, the stiff breeze made reversing back from the yard to the junction interesting! The forecast is for snow tomorrow and Monday, so we’ll hang on here till Tuesday, then cruise back down to Fazeley and back. It’s about 11 miles each way, so will take 2 days the way we travel. We can do a bit of shopping at Whittington on the way back. We have to run the engine to generate power, so we may as well go somewhere while we’re doing it! 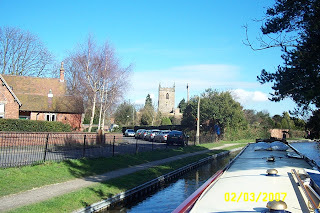 Back up to Fradley today. We’ve had a good couple of days near Alrewas, I took the opportunity to tidy up the top bend on both sides of the bow below the front cockpit. Unfortunately, the right side “bloomed” overnight. The finish is not particularly good, anyway, so I need to flat the paint and recoat at some point. Arrived at the BW office and sanitary station just before lunch, did the “essentials”, and went in to check the status of the stoppage at Armitage. We’d heard there may be a problem, rumour was correct. The bridge works would not be completed on time; the contractors were working all weekend to try to get the navigation open early next week. This throws our schedule out, but if they open up on Monday, we could still be in Macclesfield on Thursday, to collect the mail and hire a car for Liverpool on Sunday. One plan worked, though. I’d ordered a bouquet of flowers for Margaret at Willington, to be delivered to the waterways office (It’s our 24th anniversary today). They were there waiting for me, so Mags had a pleasant surprise. Rather than push on up the flight past Shade House lock, we decided to stop here in Fradley till we got more info on the stoppage. So we moored almost opposite the office, on the visitor moorings. I rang Fazeley, which is the Area Office for BW Central Shires, to get the most up to date information. They had just been told that there was no possibility of opening before NEXT weekend, and therefore the stoppage would be extended until Saturday 24th. This throws a huge spanner in the works, so we’ve got to devise a Plan B. The first step is to get the mail (including my driving licence and race entry details for Liverpool) re-routed to here for collection. Yvonne in the shop has kindly agreed to receive it for me. Now I’ve got to find a car hire company near here…. 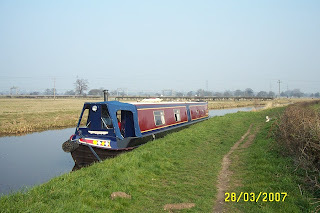 The weekend at Branston was enjoyable, fine weather and chatting to other boaters and walkers on the towpath. I emptied the front cockpit onto the bank on Sunday. Its amazing how much junk can accumulate in such a small area in such a short time. Gave me a chance to have a sort out and clean up before reloading it. Had an 11 mile training run on Sunday, but I seem to have pulled a muscle in my left hip, causing a bit of pain. I’ll have to see how it goes. I started today with a 5 mile steady run, but if anything the injury feels worse, so I’ll take a couple of days off for repair. Then we had a gentle, uneventful cruise through to Alrewas. 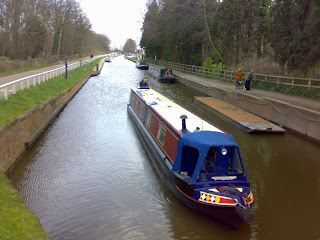 Strolled up to the Co-op and did a bit of shopping, then carried on out of the village, through Bagnall lock and moored past the road bridge. In the past we’ve moored nearer Common lock, but last time we struggled to get close into the bank, so we decided to moor on the pilings nearer the village. 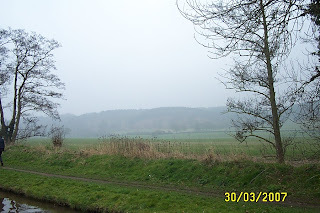 We stayed at Willington until today, with an overnight excursion down to Stenson. 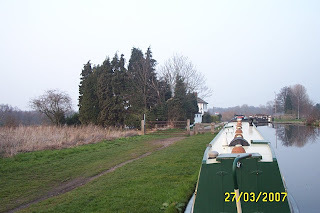 We had to turn around anyway, so used the winding hole next to the lock, and moored opposite the marina. The group from Canada arrived shortly after us, and turned in the marina entrance. 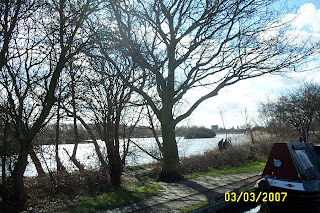 They didn’t want to stop, though, so after a look at the lock (at 12’ 3” deep and broad, quite a different proposition to those they’d encountered so far), and a visit to the café, were off back to Willington. Spent the time walking Meg, training for Liverpool and doing those odd jobs that always seem to need doing on a boat. We’ve also decided to change the layout of the galley and dinette, so were discussing options. I’ve booked the boat in at Orchard Marina towards the end of April. They’ll re-black the hull, and then I’ll use one of the fit-out bays to do the work on the galley. There’s a B&Q in Northwich, which’ll be handy for bits and pieces, and I can use timber and panelling from Orchard’s store, which will match the existing interior. Meg enjoyed the stay, we were on a major dog walking through route, so she had the opportunity to make lots of new canine friends. The weather has been pretty good, so the paths are drying nicely. Even last night’s heavy showers didn’t turn them back into quagmires again. 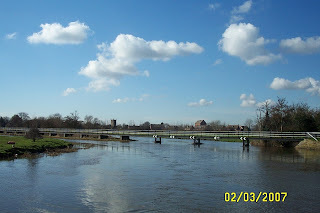 I heard that the Trent is still closed to navigation, though, due to high water levels. We were off today after visiting the sanitary station, away around 11:45. Stopped at bridge 29 entering Burton on Trent to shop at the Co-op, then on through the town. Although threatening showers, we got away with just a few spots of rain mid-afternoon. Went through Branston Lock and stopped just short of bridge 34. There’s likely to be less foot traffic this side of the bridge away from the water park, and we have a clear view to the SE so can put the dish up if we want. And we’ve a nice grassy towpath outside the door! We’ve been joined by a couple of hire boats and another private boat since we moored. Interestingly, one of the hire boats is “Prince Hal”, from Barton Turns. This is the boat that the Canadian party were using, so they must have got back in one piece. 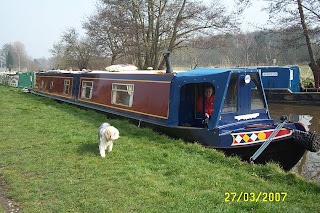 More interestingly, an earlier “Prince Hal” is moored just outside of Burton, now in private hands. Locks (since last entry) 2, miles (since last entry) 11½. We set off from Branston Water Park towards the lock, following a couple of boats. As we arrived the first was just descending the lock, so I went and had a chat with the crew of the second. They are a family of Canadians from Calgary, on a narrowboat for the first time. They’ve hired a boat from Barton Turns Marina, and, apart from the weather, seem to be enjoying their trip. We passed them in Burton, where they’d stopped to sample the delights of the Marston Brewery. Hit Dallow Lock just right, with a boat just coming out and another waiting to come up, but as we slowed near the bank, Meg decided it was time to stretch her legs and hopped off onto the towpath! I handed the tiller to Mags, and followed the errant mutt post haste. 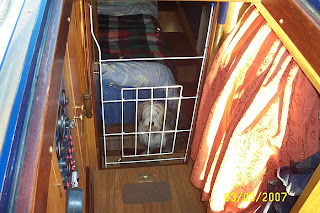 By the time we returned, Mags had manouvered the boat into the lock and was waiting for me. Meg was unceremoniously bundled back on board so we could descend the lock. I spent the rest of the cruise to Willington thinking of ways to prevent her from absconding. 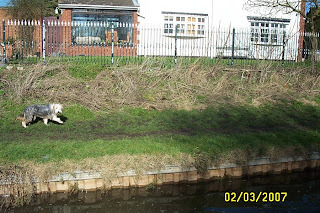 She’s normally OK, but as we slow down for locks, she assumes we’re going to moor up, and wants to get off. Bruno was the same, at the start. 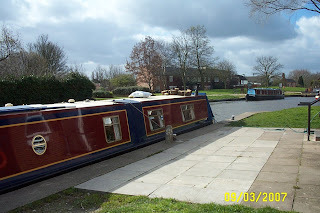 Finished the fine dry day at around 14:45, moored at Willington. 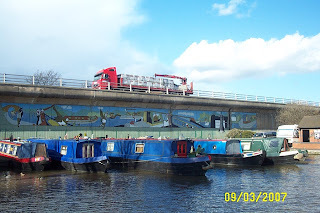 Several Canaltime boats were moored near the bridge. We’ll be stopping here till Monday, the forecast for tomorrow is horrible, with heavy rain and wind. As a result of the episode with Meg at Dallow lock, I modified the dog gate I made ages ago for Bruno. A light frost overnight led to a fine bright morning. No training run this morning, so we were away about 10:30. We were amazed at the number of boats moving, we counted 8 before we set off! 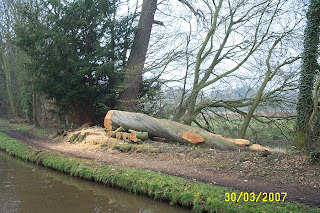 Most were heading towards Fradley, I expect to get moorings ready for the protest demo on Sunday. Altogether we saw 13 today, the last at 18:15! A beautiful day, sunny with the breeze a lot lighter than yesterday. It was warm enough to dispense with the jacket at midday. Through Alrewas and out on to the river section. The water was running quite fast, even on tickover we were still moving at about 5 mph. Meg decided to hop off and have a trot along the towpath alongside. 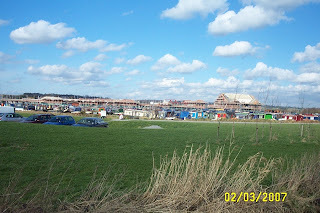 A really enjoyable cruise to Branston Water Park, past Barton Turns Marina, where the new restaurant complex is coming along. It’s due to open shortly. 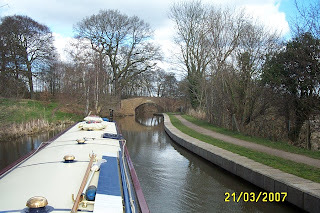 Most of the locks were in our favour, with the traffic heading towards Fradley. We moored up around 14:00. Took Meg for a walk around the water park, will explore further tomorrow. Rain overnight, but a fine, breezy morning. 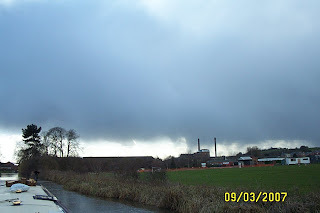 Moved off the mooring, through the junction and filled up with water, did the loo and got rid of rubbish at Fradley BW. Had a 15 minute chat with a party of Americans from Minnesota, who were heading back to Sawley on their Canaltime boat. They’d had a mixed week, weatherwise, but were enjoying their trip. Carried on through Keepers, Hunts and Common locks, and moored at our regular spot just before Alrewas. Took Meg for a walk around Alrewas this evening. A pretty village, with thatched cottages, an attractive church, and good moorings.